There will be server maintenance on July, 25th. 2018. There will be no server maintenance on July, 18th, 2018. Thnak you for your interest and love in our game. We will have a SUMMER ATTAAAAK EVENT for this summer. Check the below details and get some luck! 1. Reward for SUMMER ATTACK! - Participate to PVP with counterforce! 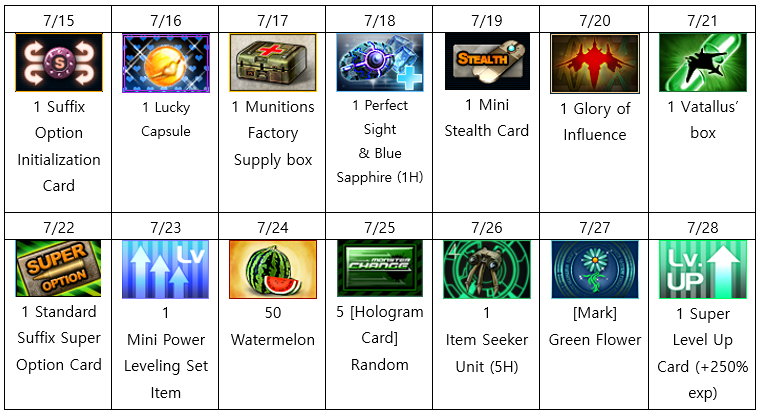 We will give you special items for winners of PVP(Through a lottery)!! - Those will be given without any notice. 2. Check the attendance and get some summer supplies! - Every weekend, it will be added one more buff! There will be server maintenance on July, 11th. 2018. There will be no server maintenance on July, 3rd, 2018.